Whether it's the zing of vinegar or the bite of horseradish with just the right balance of brown sugar sweetness, spicy mustard lovers can be passionate about finding their favorite blend. Often described as the world's oldest condiment, some monasteries began making mustard for income. A practice still used as a selling point today. It's use as a food goes back thousands of years. But odd tales of other uses are also common such as rubbing it on your headlights when driving through fog or securing loose tile. This condiment is made from the small seeds of a mustard plant which can be mild or spicy. Plants that produce black seeds offer the most heat, brown seeds are more medium heat in the mustard family and yellow or white are the mildest. In the common hot dog mustard, the seeds are most often yellow and ground to a fine powder. 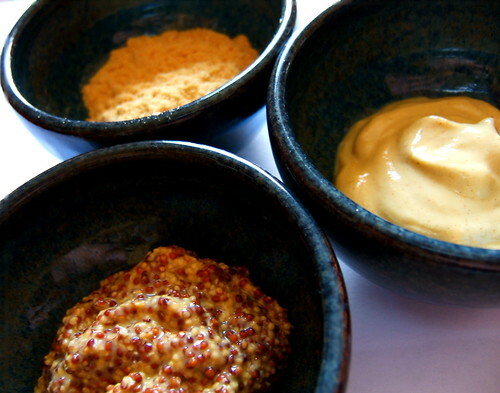 In spicy mustard the seeds can also be ground fine but commonly are given only a coarse grind. When using whole mustard seeds many recipes will advise mixing the seeds with a liquid for overnight soaking. The seeds or seed powders are mixed with liquid such as vinegar, water or beer. Look at the ingredients in the mustard you buy to start figuring out what strikes your mustard fancy. If you like Grey Poupon, then try adding a white wine. Mustard served with bratwurst commonly calls for beer as a liquid. The simplest mustard recipe is finely ground seeds mixed with water in ratios that provide a nice spreading consistency. (Try starting with a 2:1 ratio, such as two tablespoons powder and one tablespoon water.) But even a mild mustard seed can offer a biting heat which can be cooled down by replacing the water with liquids like wine, beer or vinegar. How to spice up a mustard? The possibilities are endless. From sweet honey to flaming hot habanero peppers, if it sounds good and you can incorporate it evenly into your mustard spread go for it. Here's a good recipe spot. Don't start off with a big batch but do write down each ingredient and how much was used for every batch. You never know when a blend will turn out just perfect and nothing is more frustrating than trying recreate perfection from memory.